Welcome to The Warwick Holiday Flats.. 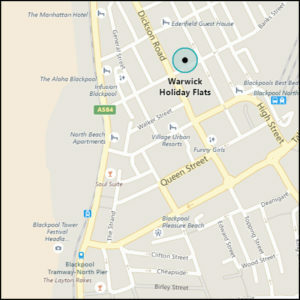 The Warwick Holiday Flats are now run by resident owner, John Plant. John is a veteran in the hospitality industry, having previously owned a number of hotels in the resort since 2001. Located on Banks Street in Blackpool, The Warwick Holiday Flats offer you a selection of 5 well equipped, modern holiday apartments to suit individuals, families and couples all year round. 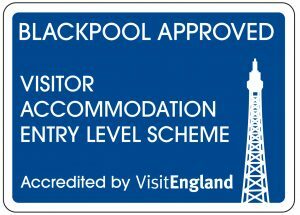 We are situated just out of the main town, minutes from Blackpool North Railway Station. There are tram and bus stops just 150 yards away, on the promenade, to take you to the Blackpool Pleasure Beach or to Fleetwood and Freeport Outlet shopping. The Grand Theatre, Blackpool Opera House and Winter Gardens Complex, Hounds Hill Shopping Centre and of course Blackpool Town Centre are all within easy walking distance. 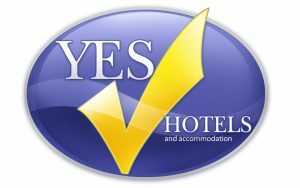 We do not accommodate Stag/Hen parties or young persons under the age of 18. If you are booking for any of these types of party then please be prepared to be turned away at the door without a refund! THE FLATS CAN ACCOMMODATE FROM ONE TO FIVE PERSONS ONLY. A welcome pack with toilet roll, kitchen roll, washing up liquid, multi purpose cleaner, dish cloth and scourer. Complimentary refreshment pack to allow for a welcome cuppa upon arrival.